Matte finish 3-1/2x3-1/2x7/8" Aqua Blue Jewelry Boxes are a gorgeous shade of blue! Every box is filled with non-tarnish ultra white synthetic cotton. Jewelry boxes contain 100% recycled boxboard which is the largest component of the box by weight, does not include paper coverings. Made in the USA. 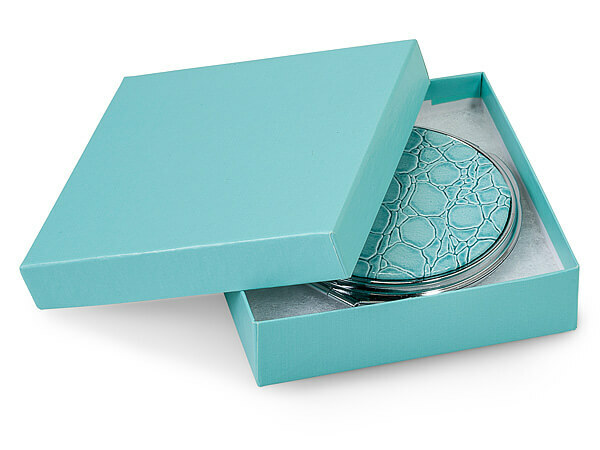 Matte finish Aqua Blue Jewelry Boxes are available in the most popular sizes. All boxes are filled with non-tarnish ultra white synthetic cotton. Made in the USA. Jewelry boxes contain 100% recycled boxboard which is the largest component of the box by weight, does not include paper coverings. Made in the USA.